CCSU Student Elections: Get Involved! Can you champion student causes, represent the student body and campaign for change? 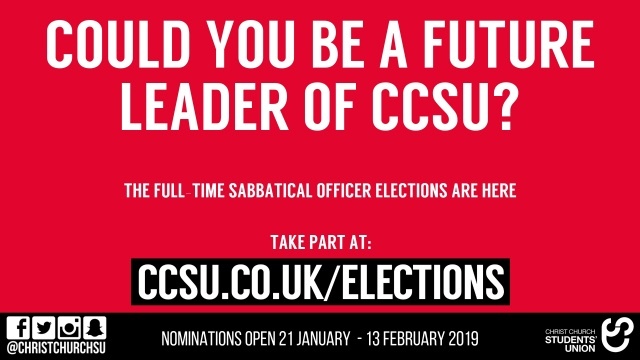 Nominations for the Student Elections are open until midday 13th February 2019 for students to work full-time with the Students’ Union from July 2019-July 2020. There are four full-time positions (starting July 2019) you can stand for and you will need to take a year out of your studies or take once you graduated if you are in your final year. The majority of previous candidates have decided to run for election whilst they’re in their final year at Uni but some have chosen to take a year out in the middle of their course. Not sure what position to run for? Why not take our fun personality quiz! Once nominations close then it’s time for the candidates to start campaigning for student votes and then it’s your chance to choose who you would like to represent you at Christ Church. Voting takes place 4-7 March and last year over 2350 students cast their vote to choose who would represent them. For more information head over to ccsu.co.uk/elections.